The good thing about living in Mumbai is that there’s always something exciting to look forward to. A brand new pop-up, a flea market in your neighbourhood for all things aesthetic, that new restaurant everyone’s been raving about, or even an art exhibition to discover some new talent. And after every busy week of travelling to work and back, who doesn’t appreciate stepping out of the house with the intention of unwinding in the city. So adding to the list of possible events that you could attend this weekend (and the following week, if you’re up for it) is a unique art exhibition called ‘Next Stop’. Featuring 50 brilliant travel-based artworks by 12 independent artists covering 20 destinations in India and beyond, this exhibition is being organised by Kulture Shop—one of India’s foremost graphic artist collectives that aims at redefining the country’s visual identity in the 21st century. The exhibition starts today and will go on for an entire week until the 7th of July 2018, at Kulture Shop in Kala Ghoda. A reflection of what it’s like to be inspired by different cities, culture and architecture, this exhibition features a range of independent graphic designers trying to experiment with their own style and structure. 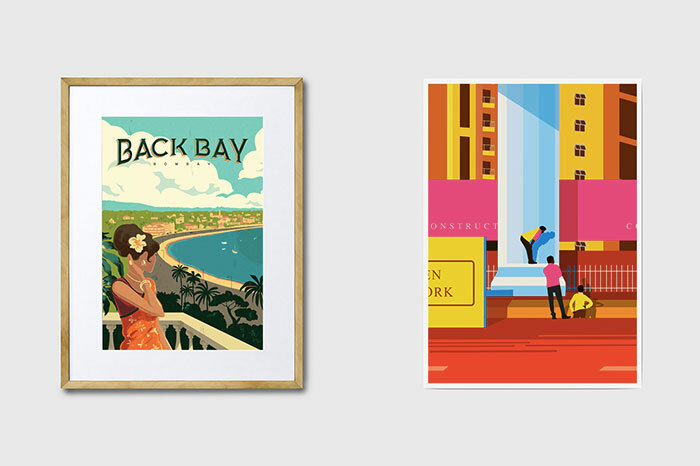 Co-curated by Mohini Mukherjee, Kulture Shop’s Artist Manager, the exhibition features detailed hand-drawn skylines by Broti Bhattacharya, clean classic graphic shapes and colours by Praveen Yaramilli, and even a composite print of photographs of Copenhagen buildings clicked by Siddharth Dasari himself. “Curating is always full of surprises. Take for example Dallas Fernandes’s Bombay Flashback series. Initially created for the restaurant Bombay Vintage, we discovered the prints of a glamorous, nostalgic Bombay when Dallas himself walked into our Kala Ghoda store with a friend to browse,” says Mohini. An opportunity for the artists to reimagine their home cities or work outside their comfort zone by exploring other places, this collection is vibrant and enrapturing in the way it plays around and captures the culture of a city. Other featured artists include Reshidev RK, Art Director at Weiden+Kennedy New Delhi, Muhammad Sajid, Artist and Designer at FTW Bangalore, Kanika Sethi, a Mumbai-based independent art director, and Chaaya Prabhat, an independent graphic designer based out of Chennai. So stop by Kulture Shop’s Kala Ghoda store this weekend for some underrated and affordable art and canvas prints!